Twitter has acquired Posterous – hooray! I’m happy for the Posterous team, they made a great product and are now moving onto greater things. So here we are, four years on from the happy day when we thought we had at last found the perfect blogging platform . A simple service that you could email your words to and a post with pictures would be published, but more importantly cross posted and shared to the other social platforms that mattered to you. It’s such a simple concept. I jumped ship from Blogger in 2009 as I thought it had gone stale and wasn’t being updated since it had been acquired by Google. 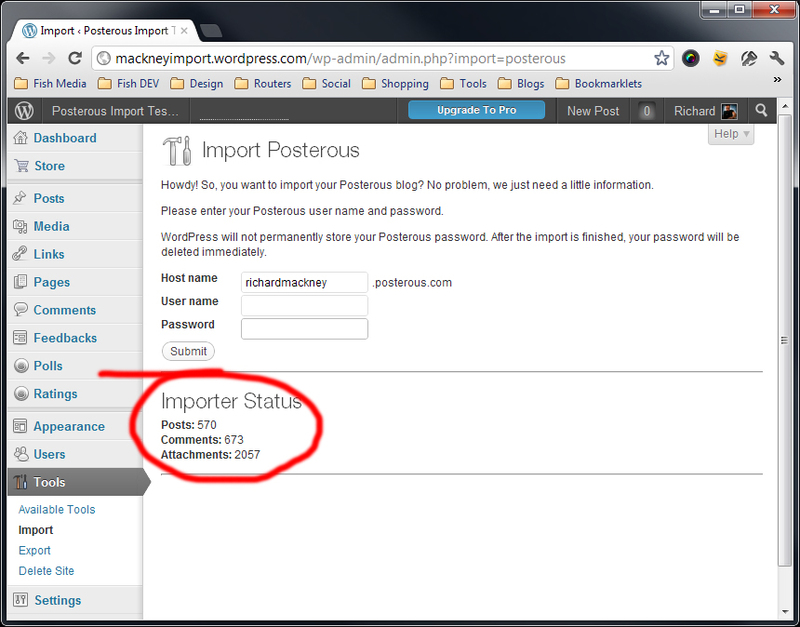 Moving to Posterous was a simple task of using the import tool to grab all of my posts including the embedded media. Posterous was offering tools to allow you to easily jump ship from most of the popular blogging platforms and they openly shouted about it – making enemies from day one. If you are reading this and you own a Posterous blog, you have already backed up all of your posts and media haven’t you? I do it every time I post to a hidden Blogger account using the automatic cross post – it’s hidden as I don’t want duplicate content floating all over the net. If you haven’t then I suggest heading over to WordPress.com, setup a new blank blog and then hit the Tools > Import section to copy every single post onto WordPress.com. I’m not suggesting you’ll ultimately stick with WordPress, but at least it will be allowed to breathe in another dimension. Once you have your full Posterous safely backed up you can do one of two things; Decide to hold out and see what will happen to Posterous or Move. Personally I feel like moving as although I have not seen any definitive message saying that Posterous will eventually be shut down, I don’t feel I want to invest any more of my energy and promotion over a platform with an uncertain future. I also want to get a chance to re-map my URL’s before the service disappears. Now, let’s get onto the main subject of picking a new blog tool. Firstly, I must state that I run a company that produces bespoke web and mobile tools and that it would be extremely easy for me to re-point my domain name to our servers and install one of our own systems to run a blog. Our system uses URL re-writing to re-map broken or moved URL’s and this would be a pretty painless move. However, as our system is totally bespoke to companies it’s not suitable to individuals who want a free or low cost solution and therefore I cannot recommend it or promote it as a Posterous replacement for individual bloggers. So in the spirit of ‘the free internet’ I have started to research options. I’m going to limit my search to hosted solutions for pure ease. Back in the day I provided multiple hosted PHP forums and was forever adding patches or bug fixes and generally being a hostmaster rather than a creator. This isn’t an area I’m keen to go back to and I’m prepared to pay for a stable solution if required – after all a paid for service means you’ll never be worrying about the providers future or the sudden inclusion of adds. I say obvious because as mentioned above it has an import tool, and if you have just followed the steps above, you’ll already be up and running! WordPress has been around for yonkies years (like donkies and yonks) and almost has a cult following. When I first started promoting Posterous I would always get the WordPress brigade shouting me down – I guess they are now sitting there with a smug smile on their face? I had always known WordPress as a PHP based ‘self-install’ solution and this had put me off, however WordPress.com is a fully hosted solution meaning you will never have to worry about maintenance. The issue I currently have with WordPress.com is the URL structure. For example my current blog posts look like this http://domain.name/post-title but when transferring to WordPress.com my URL structure is now http://domain.name/year/month/day/post-title It does look like they will redirect if you miss out the /year/month/day/ part of the URL so search engines and existing back links should be OK, but I’d prefer not to see this. It looks like the self-hosted route has the option of changing this permalink, but we’re not considering self-hosting are we? I also took advantage of the in-post photo gallery on Posterous, which mean that some of my posts now have masses of inline photos (one post has 180 photos!) and while WordPress.com impressively imported them all, I’m now left with a clean-up operation. A free account gives you 3GB of storage space, but ‘may’ contain adverts. Please check the Premium Features page. Domain Name & Mapping, 10GB Space Upgrade, No Ads, Custom Design, VideoPress (whatever that is). If you read and acted to my post in 2009 you will have already cross posted every single post to Blogger – If so, this could be an immediate choice. Blogger has seen development over the last couple of years, but it has been slow. One great advancement is the dynamic views – take a look at a blog that I decided to keep with Blogger and play with the different view options in the drop down list http://photoblog.mackney.com/view/mosaic It’s also very easy to customise and play around with the theme by using sliding bars to set your desired width. See http://www.croyde-surf-cam.com/ for some surf dude pinkness. The ‘newer’ draft interface is much better so be sure to set http://draft.blogger.com as you default landing space. You will need to update your images if Posterous turn off their s3.amazonaws.com storage bank as the Posterous cross post function merely links the images. 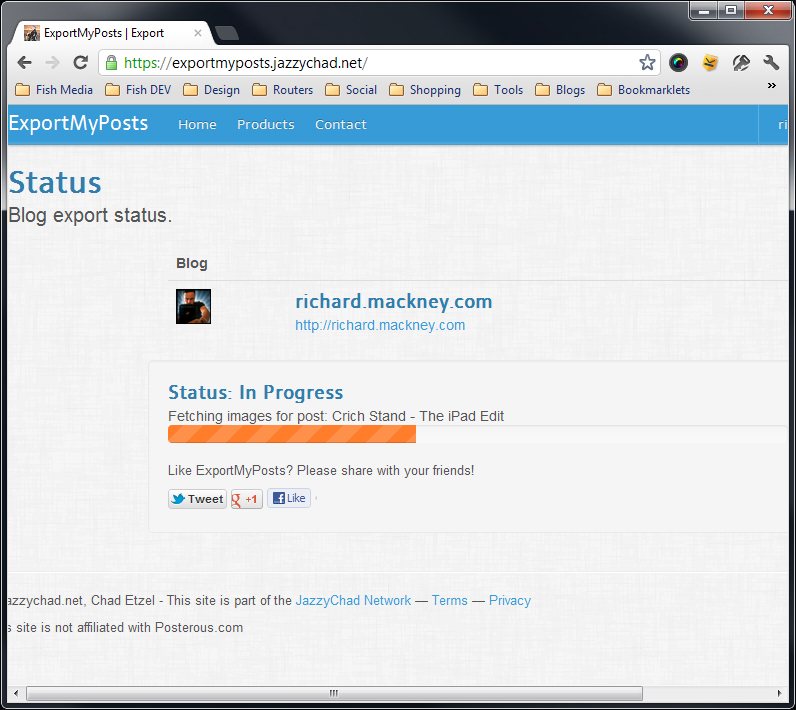 Posterous ‘may’ release an export tool that will save in Blogger format and if so … Yay. If you have a custom URL and was hoping to keep the URL structure, then Blogger is a no-go. The posts end with /year/month/post-title.html which will clearly break every single published link to your site. If, however, you have a Posterous URL like http://myblog.posterous.com then it’s going to be broken anyway, so give Blogger a look before you leap. I think Google have plans for Blogger and it may become Google Blogs, just like Picasa may become Google Photos and they may become even more ingrained into Google+. Remember that if you are a fan of Google+, Picasa, Google AdSense and YouTube then you’ll be in good company with one single sign-in and in-house embedding tools. You may even benefit from prioritised search engine placement (but don’t quote me on that!). I have always recommended Google Blogger to my corporate clients if they are looking for a third party blog tool (even when tempted to tell them about Posterous). Google Blogger is a Free service. I’ve known about Squarespace for a few years and have always heard good things, but until now I haven’t really had a look at its functionality or example websites. It’s completely hosted and managed and after watching their introduction video I’m starting to get really interested in their design interface. The best thing for you to do would be to take their tour to get a feel for their service. I’m particularly impressed with the modular approach and lovely interface (I’m a sucker for design). They offer an importing tool, which I suspect you would need to port to WordPress.com or Blogger before then importing to Squarespace and they offer automatic URL remapping to avoid dead links (nifty). They will even crawl your images and re-host them, ensuring they are completely contained within your account. I have no-idea if they have a Posterous importer, but after the recent news, they should. Strictly speaking this is a full content management system for a full website, but It seems to be becoming increasingly popular for bloggers. It’s a large (massive) stable company and user support seems to be one of its many attractive features. You can pay monthly, but for an annual fee of $144 USD (£92) you can have 3GB of storage and 20 pages (individual blog posts are not limited). OK, this isn’t the path of least resistance, but with all the talk of data portability and ownership at the moment I thought I should look at the other options. For the true geek there is Markdown which basically is a plain text format that can be converted to HTML. Posterous actually supported this and it has gained quite a following in the Geekdom. With intermediate interfaces you can write blog posts and simply place them into your Dropbox folder on your desktop (or mobile device with a Markdown writing app) the online processor then converts these files into a blog complete with an atom feed. When Posterous launched I loved its simplicity and minimal design. I still feel that my page design needs to be minimal so this approach could be the route I decide to follow. With a custom domain and all of your data safe in your Dropbox, future moves wouldn’t be so difficult. The only drawback may be the ability to email a post on the move and the fact that all media will need to be embedded (e.g. Flickr, YouTube). Due to the fact I am now faced with a massive blog image clean-up task – I sort of wished that all of my images were already simple embeds. Thanks to Gordon Tant for pointing out these Markdown services. Please also see this review from Ben Tsai. Posterous might not be closing – Twitter may even make it much better. You might not need to leap right this instant. You may want to wait until Posterous produce an export tool, this may open up a whole host of new options. They may even handle the redirects for you for a specified time. Find a blog platform where you can setup a trial and have a play with the interface, import your Posterous blog and evaluate any issues before you swap the domain. Find a blog platform that will import your full Posterous site including the multimedia. Find a blog tool that will keep your existing URL structure (Posterous custom domains only) obviously this would leave masses of broken links not only within your own blog, but around the web and within the search engines. Over time search engines will recover and if you have added Webmaster tools to Posterous (do it now before it goes) you will have the ability to do some damage limitation. Find a service that offers some sort of premium option. Companies that are making money and actually getting paid are probably less likely to disappear (it doesn’t stop them getting acquired though). Decide whether you love playing with the big boys or would prefer to take a risk with a smaller company. Remember to read the privacy and ownership rights of every service. If you think Facebook are the only ones mining your data you’ll be wrong. Find a service that you can simply email your posts to. Consider using FeedBurner for your site feed as this allows future portability and keeps your subscribers. If Posterous goes, I will lose many followers, but by changing my FeedBurner feed path I can at least retain subscribers. I also suggest turning on email subscription as I have found that many people now prefer to get an update in their inbox rather than trawl through their constantly growing RSS reader. Oh, and yes FeedBurner was acquired by Google in 2007. 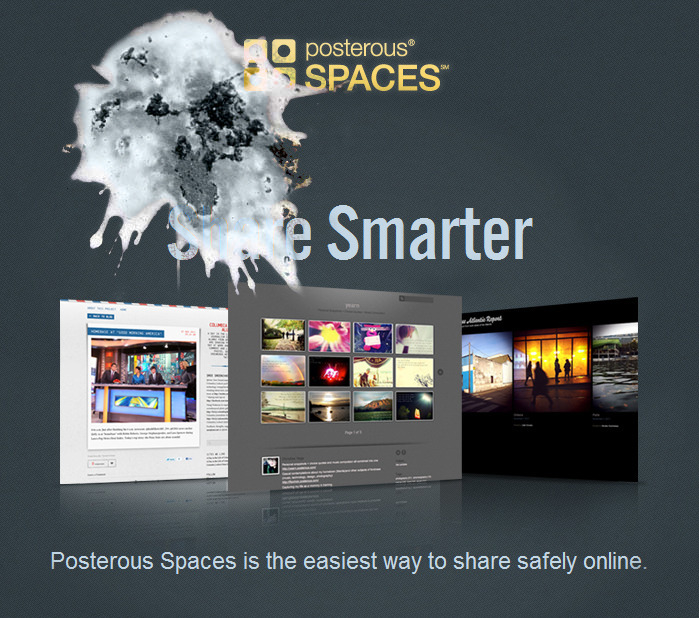 If you can’t wait for Posterous to release a tool I would totally recommend this service. I have downloaded a 700MB file containing everything I have published to Posterous and it has been saved in a simple HTML structure that could simply be hosted on Dropbox as an archive site. While you can certainly use WordPress.com to make a copy (including comments) I have found the import tool to be slightly hit and miss when pulling your media across – and it will not grab your video or audio files or original size images. 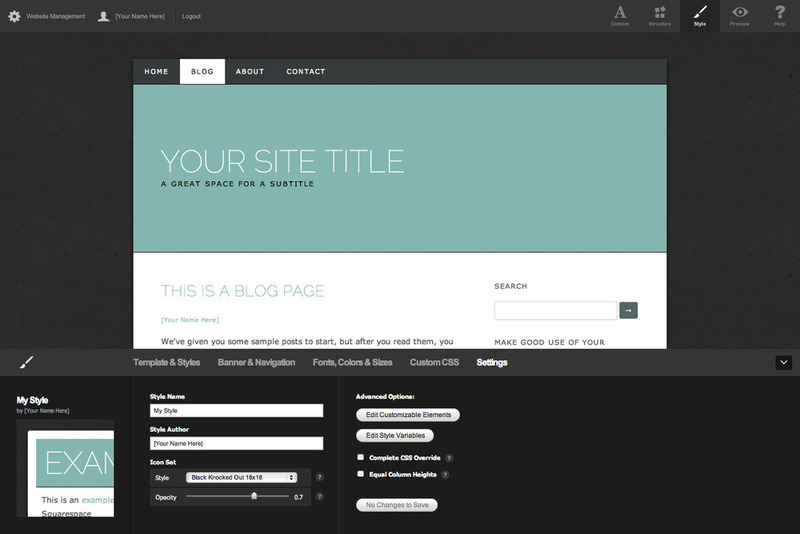 Using a combination of ExportMyPosts and the WordPress.com import tool, you can ensure you have every element you need to re-create your blog. Thanks for a great post Richard.I have a photo blog on Poasterous and chose the platform for all the reasons you gave above. It’s simplicity and cross-posting features are perfect.However, I too fear the demise of the service and this post provides an excellent lead-in to sorting out both a backup of and a new home for my blog.In addition to Posterous (for the photo blog) I use WordPress for my main blog, so I may choose to have everything in WordPress (self hosted). My only concern is in matching the simplicity and ease of posting to Posterous from numerous apps and services. I’m sure a little research around that will reveal a simple mechanism to allow the numerous apps I use to pot photos directly to my WordPress blog.I’m looking forward to seeing whcih way you decide to go.Thanks again for the information,Craig. WOW, some amazing comments. Thank you all. One thing is very clear – comments go much further in making a post complete so being able to export the comments is an absolute must!I’m still totally unsure as to the direction I will take, but will write up my process once I move. Great post Richard, and comments. I temporarily have moved my hosted WP to WP.com due to some malware I can’t remove and the host company will not help me with. Since porting all my posts to WP.com, I have done some clean up work, not too bad on photos and storage is still below the limits. I was going to move to Posterous and give up the self hosted headaches, but now I’m glad I didn’t. I would prefer Tumblr, however, they don’t currently have any backup tool (For Windows users, Mac app in beta) or import tool. I would lose a lot to move over to Tumblr. I looked at Google Blogspot, which is where I started before outgrowing it and needing self hosted options. Its not the best right now, but it seems a better option if you are heavy media content.I hope this all works out for the users in the end. Right now I am not putting any more effort into Posterous until I see where it is going. Thanks for the info on using Dropbox. Although, I think you will end up paying for storage eventually if you start hosting media and copy which may be more expensive or limiting than just paying for hosting. I’m going self hosted wordpress. I’ve used Blogger, Posterous, Tumblr and because of posterous’ recent announcements, I have exported to the hosted WordPress.com. I am cleaning it up, and will soon move it to a hosted WordPress .org I have set up. It costs about the same as the $100.00 value pack that WP.com offers. It will also require some maintenance and more effort, but I will own everything there, and I won’t need to worry about another free service going away. The flexibility of design and options are almost endless, and the plug ins are awesome also. I feel that if you have the technical skills to go to a self hosted WordPress then I think it’s the right move. Especially with some host companies offering a few click installations within their control panels. I thought this was a good video by Sean http://seanclark.com/wordpress/the-easy-way-to-install-wordpress-in-under-3-minutes/. There are quite a few people that I chat to that wouldn’t really know where to start with self hosted and I think they need a decent hosted solution that isn’t silly money, but that also isn’t going to go pop soon! Currently this entire blog is WordPress self hosted on an Amazon EC2 server and I think it would be good to note the moving process in a post soon as I have had to use a few plugins to make the move (404 redirects etc) – however, I’m still waiting to see what tools Posterous are going to offer. Thanks for the comment Gary and let me know how you get on. If you Autopost to any other blog… all the photos and embedded videos will still reside on Posterous. That means dead links. THAT in turn, means being dropped from Google’s search results.